What is the Merch by Amazon? 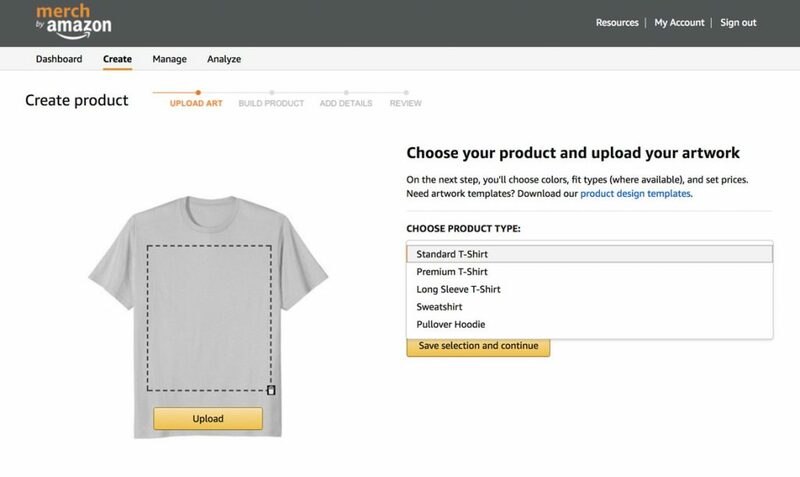 Amazon.com announced Merch by Amazon, a Print on Demand (POD) service on 2015. 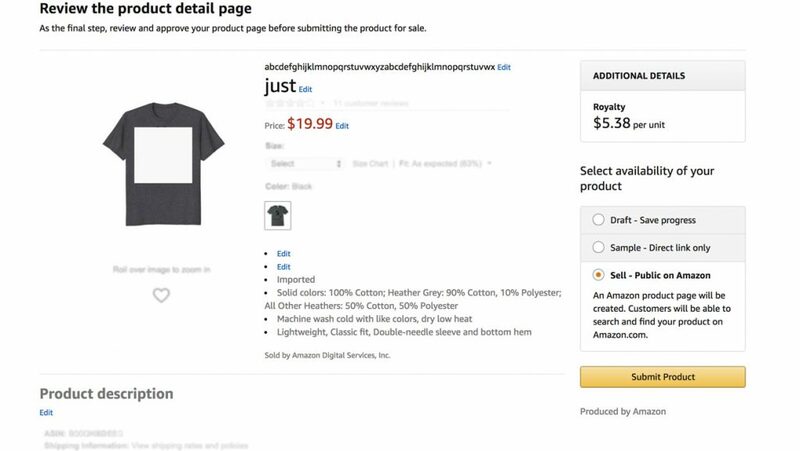 The platform allows you to add your own branded t-shirts and list it on amazon.com, which is completely free. When I say branded, it means designed by you while printed, sold and shipped by Amazon itself. This means you can start selling your custom t-shirts on Amazon without investing a single penny. 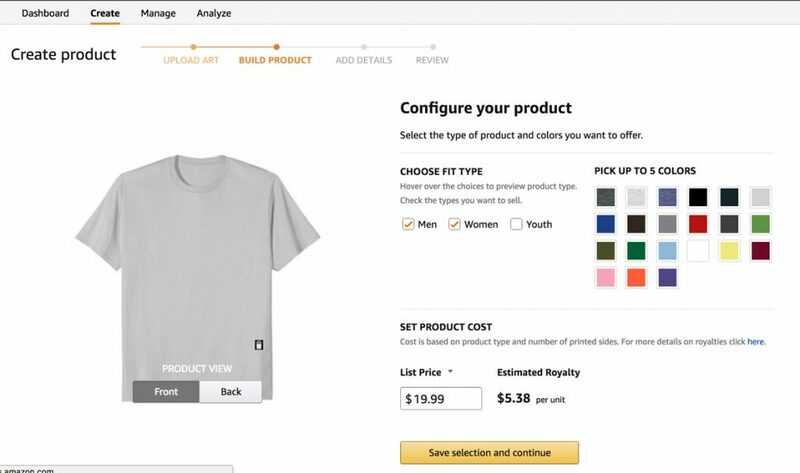 When a sale is made, Amazon will use its own Amazon t-shirt printing services and take care of the inventory. 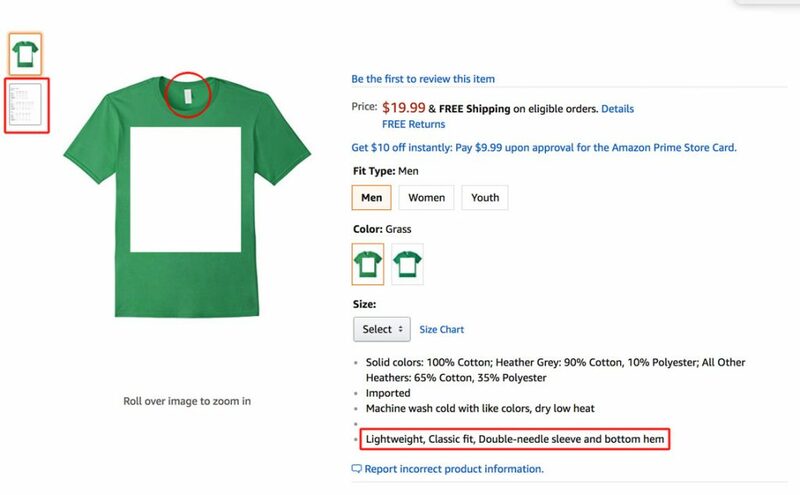 Those types of products are known as Amazon Merch T-Shirts. Currently Merch by Amazon only ships to customers in the United States but you can apply for an account from any MBA supported countries. When a sale is made, you also earn a royalty. Your royalty increases as the number of sales increases. Sales can be made organically or by paid promotion. 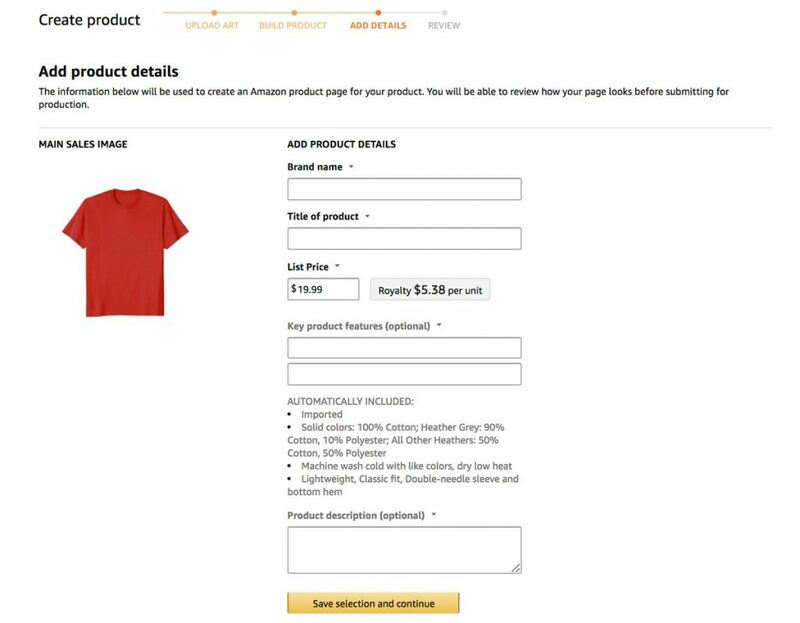 You can even use AMS that is Amazon Marketing Services to get your shirt for different keywords through paid promotion. How to sell t-shirts on Amazon using Merch by Amazon? First thing first, you need to request for an invitation. Apply for an account and wait until you get approved. The approval process may take anything between 3 months to a year or more, based on the experiences shared by the users on different Facebook groups. In the past you could just fill up the invitation form and then wait. Once approved you could fill up the details. Now it seems like Amazon needs this information while we apply for an invitation. How to get approved for Merch by amazon faster? No one knows for sure but there are no shortcuts or fast tracks. Apply and be patient. In the past few months MBA started accepting new users again. On the other hand, a lots of applications were rejected as well. Most of the peoples who re-applied and got accepted were the ones who provided a strong descriptions about their t-shirt design background and a link to their portfolio. Try to get yourself listed on different other POD sites and list up your designs as much as possible. These sites doesn’t need long approval time. If you are good in designing already then you must spend some time building your portfolio on different t-shirt selling websites or even on your websites or blogs you are related to. Take it to another step and create your presence on Facebook pages and groups that you own. The more you present yourself as an established t-shirt designer the more chances you have to get approved earlier. How long does it normally take to get approved Merch By Amazon Account in 2018? Waiting to get your account approved can take 3 months at earliest or more than a year or more. To be honest there is no any specified wait time provided by Merch by Amazon. Update: In the current days, the approval process is very quick. Some of my friends got their account approved with in 2 days and some with in a week. It is really difficult and impossible to predict when the approval time will change again. Note: Some of the merch users DID NOT get any confirmation email when they were approved for a Merch by Amazon account. Login to your Merch account regularly to see if your account has been approved. Congrats! Your application for MBA has been approved now! This section is for those who have just gotten approved and taking their first step into Merch by Amazon world. Let’s go to the header section. There you can see Resources, My Account, and Sign Out buttons. 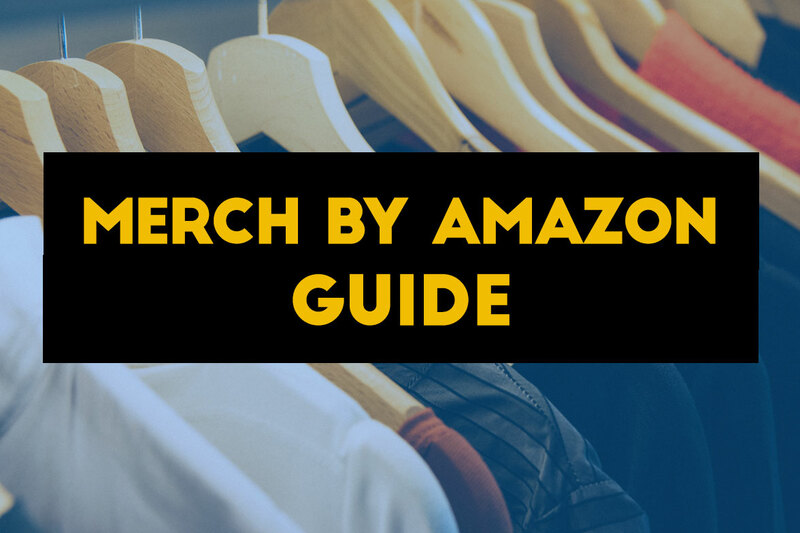 In the ‘Resources’ you will find everything about Merch by Amazon, FAQs, ToU, what you should do and what you shouldn’t. I strongly suggest you to read everything that is listed there before starting to upload the designs. Under ‘My Account’, you need to fill up your details. You must fill up your company profile (country, address, contact details, etc. ), payment & banking details and the tax details. The ‘Dashboard’ shows the number of designs you can sell that is your tier, your recent activity (sale history of last 7 days and recently uploaded designs) and message board where you can see the messages sent by Merch by Amazon that includes news and updates. You can upload your design by going to ‘Create’ or simply clicking on ‘Upload Finished Artwork’ in your dashboard. In the ‘Manage’ section, you will find all of your designs and this is where you can edit or remove your designs. You can also see the designs that you have saved as drafts (yes, you can save your designs as drafts). Once you start selling, ‘Analyze’ is the most clicked button. Why? Because, this is where you can see which design is sold and how much royalty have your earned. You can analyze the type, size and color of the shirt that is sold. Now you are familiar with the dashboard the real game begins. Assuming your design is ready its time to upload it. Before your t-shirt goes live you have to go through the 4 different steps. The uploading process is pretty straightforward. Images need to be transparent .PNG format in 300 ppi/dpi and the total size of a single file has to be under 25MB. These are very strict image requirements. You can also download the product sample template directly from the official website. This is where you need to configure your product. Choose fit type: You can select either one of them from Male, Female, and Youth or all three depending on whom you are targeting. T-shirt: Maximum of 5 different colors from 21 different colors. Long sleeve, Sweatshirt, and Hoodies: 5 different colors only and the maximum number of colors you can pick is 5. Pricing: Be realistic with your pricing. Your estimated royalty per sale can be calculated directly when you enter your price. Each of your merch shirt will be listed under the brand name. You can use the same brand name for all of your listings or you can use separate names for each of your listings. If you are looking to build a brand you should consider using the same brand name. People often search t-shirts through the brand name as well. This field has a character limit of 50. With maximum character count of 60, this field plays an important role in organic ranking in the Amazon search result. Optimize the title of your tee shirt using your main keywords and related phrases. Don’t just keyword stuff. Though this field is optional you may still want to make the best use of it by describing your product in the best way. Adding closely related keywords and phrases in these bullet point fields can help your product rank for those phrases. When your product is live on Amazon these two fields appear as bullet points along with the default texts that appears under the “automatically included” section. The character limit for each of this field is 256 characters. The string of texts under this section appears for all of the merch listings by default. As suggested by Merch, this is the place when you should talk about your brand. It has a 70-characters limit. Review the details your entered before. Check all of the entries you made in the previous steps carefully and make changes accordingly. Select “Sell” and then Submit Product to proceed ahead. 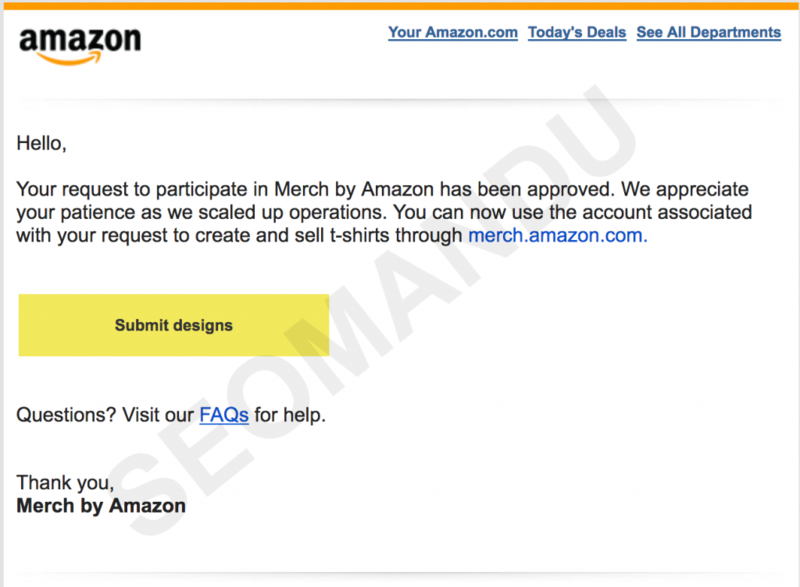 The design you submitted will be now be reviewed by the Amazon Merch team. How the review process works? Under Review: First, your design will go ‘under review’ which is automatic review. Started Process: After that your design will reach the status of ‘started process’ following by ‘processing’. Processing: If your design reaches ‘processing’ then it’s clear that it has been approved. It will be ‘live’ in few moments and you will be notified by email that your listing is live. 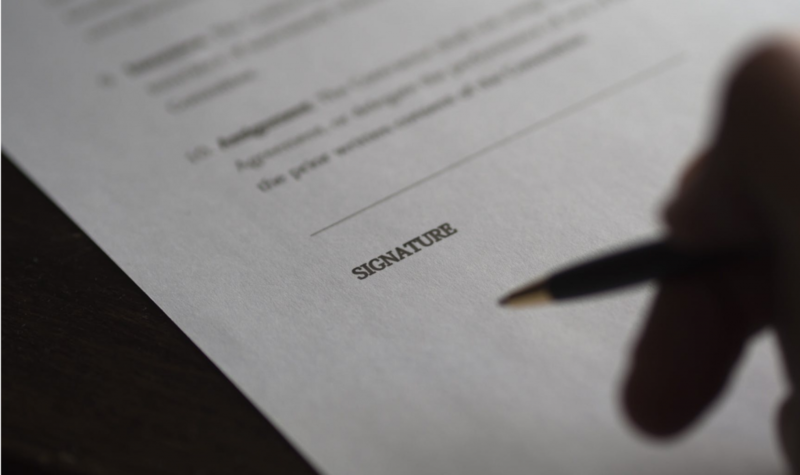 The review process can take from some minutes to days depending on what you have submitted. All of the progress can be saved as a draft and then submitted later if you have no submission left for the day. If you do not want to get your design visible on Amazon you can use the “Sample” option. Some people uses this option just to limit the design to their close circles. There is an upload limit for the number of designs you upload per day depending on what tier you are. Initially, when you get approved you can only have 10 live designs with a limit of 1 upload per day. This means you start as tier 10 and can upload only 1 design per day and can sell only 10 different designs at a time. However you can upload more products and save them as drafts until you tier up. Don’t expect to tier up as soon as you make the first 10 sales. Merch by Amazon have their own specific timing to upgrade your account so you will have to wait for it. Normally, the tier up takes place on Monday of USA time but it happens on other days as well. From tier 10 your account will be upgraded to tier 25 where you can sell 25 different designs at the same time. Once you have a total of 25 sales you are qualified for tier 100 and so on. Update: Many people who have started selling their designs on MBA are curious about the numbers of sales that will qualify them to tier up to the next level. Remember: Your slots need to be filled by 80 percent or more. The above-listed tiers are the known tiers so far. There are cases of people skipping a tier and upgraded to next tier. If someone is at tier 10, they directly tier up to 100 instead of 25. Reasons of such tiering may vary, either you have more sales than 10 or you have super awesome design. Waiting can sometimes be waste of time! But you can still make best out of it by preparing yourself. Who doesn’t want to sell on a site like Amazon.com especially when you don’t have to spend a single penny out of your pocket? Below are the things best suggested that can help be done while you are waiting for your account to get approved. Your design has to be good looking. In most cases, a well-designed high priced tee shirt can outsell a poorly designed shirt anytime. On the other hand, your design doesn’t have to be perfect to sell. That’s right! There are lots of text-based t-shirts designs that are selling like hot cakes. And this will go on and on as long as your design meets what your potential customers are searching for. So, why do you need to learn to design yourself? 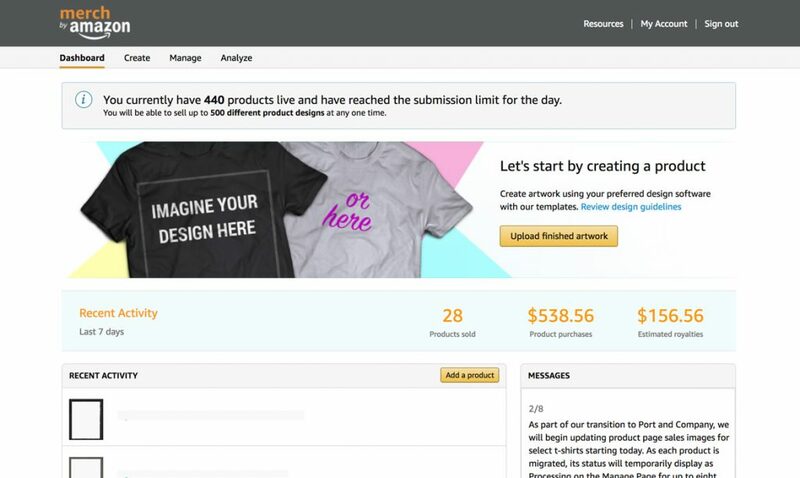 Prepare for the tier up when you reach tier 1K and you will have the opportunity to upload 40 designs per day and even higher in upper tiers.Some of the highest selling t shirts in Amazon are simple text-based designs which you can create easily with a little bit of practice. Learn to design yourself and save your time and money. Photoshop and/or Illustrator are the most popular software packages to use, but there are free alternatives available such as Gimp. Whatever you use, you’ll want to be a proficient user in order to create T-Shirts that look great and sell well. Perhaps most important for a system like Merch By Amazon is that you are able to create good-looking designs in as short time as possible. Youtube is also an excellent source where you can learn how to use these tools for FREE. The more idea you generate about niches and keywords the better it is. You will have unlimited supplies of design ideas and what people are looking for. Find out what people are passionate about, what they love, what they like and present those things in your design. Ideas are everywhere. A proper understanding of niches will help you understand more about your targeted customers. Talk to your friends, relatives, co-workers or your neighbors. Once you find out what niches to target, you need to figure out what keywords people are actually using to search for t-shirts. Targeting the right keywords will help you reach to your buyers easily. When you are targeting the right keywords the chances are high that your tee shirt will appear for those potential customers who are searching for the t shirt. Think out of the box and find out related keywords and suggestions of your main keywords. When you find a keyword with less competition and higher demand you might want to create a t shirt around that keyword and then try to sell it on amazon. Don’t just go for main keywords, try out different variations of your keywords. Using the tools listed above you can find out what other closely related keywords people are using to search for the same thing. Merch by Amazon is not only the program that you should be targeting. There are many other different print on demand (POD) websites that you can try during your waiting period. Along with experience, this can promise you some serious revenue since a lot of people are killing it already on these platforms. How to identify a Amazon Merch T-shirt? There are thousands of t-shirts listed on Amazon.com. Finding out a Merch by Amazon t-shirt can sound impossible among all of the listings. Let’s get one thing straight. Merch by Amazon is super strict with copyrights and trademarks violations. Before designing and uploading, take time to read and clearly understand the copyright and trademark rules. Violation of the copyrights and trademarks will get your designs rejected and ultimately your account will be terminated. Always be on the safe side. Stay away from the famous brands, their logos and tag lines, movies and songs. Sometimes you may dodge the automated review but sooner or later the manual will find out & Amazon will take down your design instantly. These will help your detect the trademarked word and phrases. Do it every single time when you are designing because more words and phrases are getting trademarked everyday. Like I said before, stay away from the famous brands, their logos and taglines, movies and songs or else you will get into copyright infringement. But sometime you may never have heard about your keyword being a brand name or a movie name or a song. In that case just ‘google’ your keyword and check the results. If no brand or a movie/song or anything that could be copyrighted appears then you are good to go. On the contrary of you being the one violating the copyrights and trademarks, there are so many copycats on Merch. Anyone can copy your design once it is live. If you find copycats of your design you can always report that to Amazon. You can trademark your design but there is a cost and time involved in it. If your design is really doing great and surpass the trademarking cost you can secure the trademark. – Your daily upload gets limited than on average days. Suppose at tier 100 you have the daily limit of uploading 10 products a day but then throttle happens and it can get limited to just 5 uploads a day or even worse. 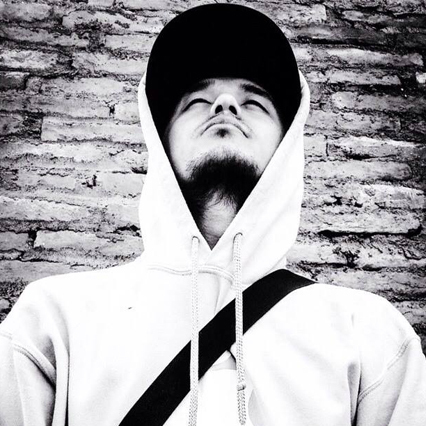 – Your shirts ranking will disappear from the search result. This can happen to any of the t-shirts, even with the best sellers. However, you will be able to find the t-shirt from a direct link to the page but disappears completely from the search results. This may results in a drop of sales while some people can still benefit from this because their t-shirt may still appear for that keyword. The Amazon ranks its items with the Best Seller Rank (BSR) depending on how well that particular item is selling. The lower the BSR of a particular item the more of that item is selling. Note: BSR value is completely independent of the ratings and reviews. BSR can be used as an important factor for your product research. 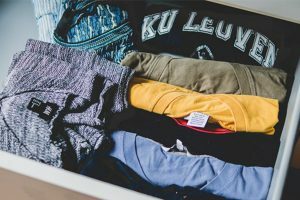 If you come upon a t-shirt with BSR less than 100,000 and having just a few products listing for a specific keyword, you may want to design something similar and try for that particular niche. The BSR indicates that the listing is getting decent sales and the few listings show that the competition for the keyword is low. This is a high chance where you can stand out with a superior design and get some sales easily. How to get your first sale? If you are struggling hard to get your first sale then you can get help from your family or friends. Upload a design and tell them to buy it or just buy it yourself and send it to them. This will help you get out of the lower tier easily. Best things in life comes free to us! Find out what resources other people are using. These are more like seasonal niches which can make you decent sales. These kind of shirt can even sell after holidays but the sales may just be low that during the holidays. Your dream of selling t shirt on Amazon is much easier with Amazon Merch without having you spend a dime upfront. With all the explanation provided in this post anyone can start selling their own custom t-shirt easily once the account is approved. From time to time, Amazon has been adding different products e.g sweatshirts, hoodies etc. to their inventory which tells us that this merch platform is growing bigger and bigger with time. With hundreds of new merch accounts approved from time to time Merch by Amazon is definitely the next big thing for future. You may want to test out the potential of this amazing print on demand service by Amazon. Have you applied for Merch by Amazon account yet? Or you are crushing it already? Let me know your thoughts in the comment section. Thank you, very nice and detailed article. 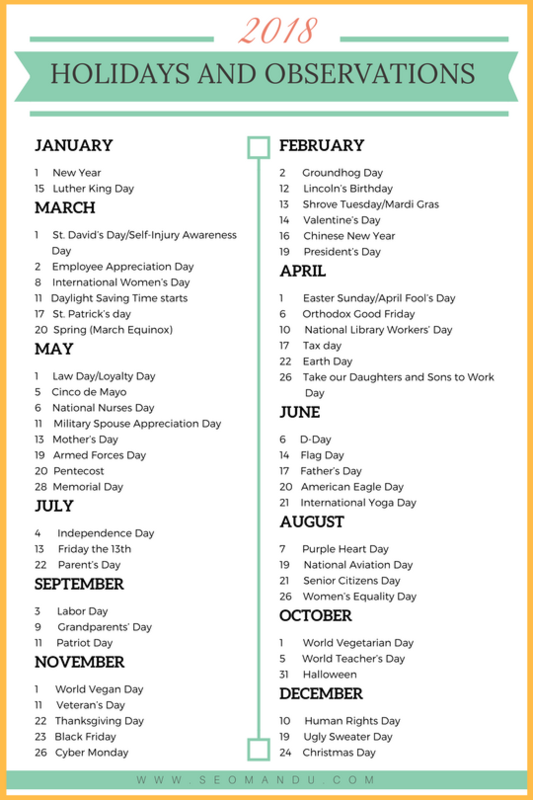 I like the holiday calendar . What about back to schoo? IHow many months in advance before holiday you upload shirts? If you have enough free slots to upload the designs then you can add it right away. Seasonal designs do slowly through the year. Nice, detailed article. I applied for MBA in March and was approved in weeks. Sold 1 item in April and was tiered up to 25. So far I have 3 sales total. I’m taking down my fourth of july tees and replacing them with halloween tees. I also lowed my price so they are selling for 14.99 hoping I could generate some sales and move up. I have been selling books on amazon for about 9 years. I believe that is why I was approved and moved up to the next tier so fast. Thanks for your comment. Few months back new MBA accounts were taking just 2-3 days to get approved and with one single sale you could reach to T25. And with around 10 sales you could tier up to T100 quick. That was just for a limited time. These things keep happening once in a while. Sometimes, MBA just limit your upload to just 2 per day even if you are in T500. Most excellent for newbies. Additional resources links are pretty awesome as well even for a season POD designer/entrepreneur. I am from Mexico, I see that they ask for SSN and bank account in order to apply for the program, is it only for US residents or I can apply if I live outside the US and dont have a SSN or a bank account in the US? Merch by Amazon is not limited to USA only. There are many others countries that you can select from.